Since Ultra® QCT™ was introduced 10 months ago, many customers around the world have experienced its benefits and have been able to improve their punching operational costs. One of these benefits is the M4PM™ powdered tool steel as standard, used in the replaceable punch tip, which outlasts two to four times the number of hits before sharping compared to any standard punch material. This increases machine uptime and part productivity. The concept of insert style tooling is not new in the punch tooling industry, but Mate’s QCT really brings it to the next level. It is the first system with a tool-less insert retention: replacing the punch tip is quick and easy by simply lifting the latch and removing the insert from the driver. No keys or hand tools required. The ease of use while maintaining high angular and concentric accuracy is one of the key designs of QCT. This translates into the possibility to use small die clearances, and yet withstand relatively high tonnages. But there’s more: the punch driver is made to last even longer with its SuperMax coated surface to prevent any wear. There is only one driver for round and shaped inserts, the inventory of drivers is reduced and operator mistakes eliminated. QCT is also fully compatible with any existing Mate Ultra system. Looking for an economical, yet highly productive solution? QCT is definitely the answer, even for relatively short production runs, as the payback time for the punch driver is between two and three insert replacements, along with reduced replacement costs. Moreover, the optional new SuperMax coating turns the insert into a real productivity tool that can stay in the punch press for an additional two to eight times without needing to stop the machine for tool maintenance. 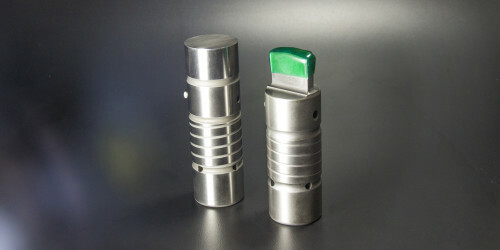 Recently the QCT range of inserts has increased with the offering of a number of cluster and forming applications. This allows the punch driver to be an even more universal solution. Finally, the small size of the insert style tooling in general decreases the ecological footprint and reduces inventory and storage space. For more details or a demo, contact your local Mate representative. Patrick Vandeputte is a Senior European Sales Manager at Mate Precision Tooling.